Oh My. I’ve been skunked. What do I do now? Oh no. Don’t do that! Stop rubbing your face on the furniture and the carpet. Oh my. It’s bad. Quick, grab her. Put her in the garage. Oh no. Now it’s on me. SKUNK SPRAY. It’s in her eyes. It’s on her face. She’s rubbing herself on everything. The whole house is starting to smell like skunk! Now what? We can’t open the windows. It’s freezing outside. And it’s cold in the garage. We can’t just leave her out there. We’ll have to bring her in and bathe her. Bathe her with what? Regular shampoo won’t work. I know, let’s Google it! It says to mix up hydrogen peroxide, baking soda, and laundry detergent. But wait. It says that this blend might bleach her black hair and you’re not supposed to get it near her eyes or mouth. But that’s where the skunk spray is. Oh, and if you leave it in a closed container it will EXPLODE. Who dreams up this stuff? This is terrible. What can I do? Unfortunately, this scenario plays out in homes across the country all too often. So what’s the answer? 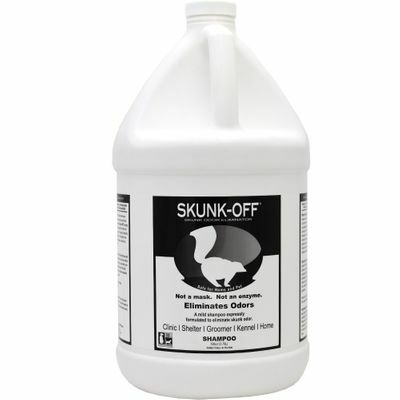 How do you safely get rid of skunk odor that is now on your pup, in your home, on you and your clothes? The answer is Skunk-Off®. This product can be safely used on your pet from head to toe. The more you use, the better. Apply liberally and work into the coat right down to the skin level. Pay close attention to the face and chest as this is usually the area of the direct hit. But don’t stop there. Keep going until you’ve covered your pet. You can smell skunk oil down to 1:1,000.000 so if you don’t complete the task it will return. When you’re done rinse thoroughly and let air dry. The shampoo will stop the odor on your pet and will keep working for weeks when the odor tries to return on those high humidity days or when your pup gets wet. 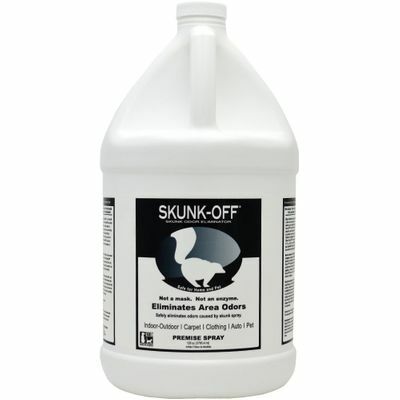 In the home, use the Skunk-OFF® liquid or Skunk-Off® Premise Spray on carpet, upholstery, bedding, walls, hardwood floors, leather chairs or as an air freshener. You can also use it in the laundry. Just add it to the wash cycle or use it in a pre-laundry soak on clothing items that are really bad. Skunk spray odor has the ability to permeate everything, everywhere. So using an area fogger might be necessary. Ventilation is obviously helpful. So how does this stuff work? Simply stated, odors are caused by molecules that can emit a vapor or off-gas. Additionally, they’re airborne and that’s how you smell them. It doesn’t matter what type of odor. Good or bad. It’s all the same. Skunk oil is a Sulphur based thiol. It’s the same type of odor that is put into natural gas so it’s easy to detect. It smells like rotten eggs. What Skunk-Off® does is stop the odor molecules ability to emit the vapor. Thus, with no vaporization, there is no odor. But it’s up to you to apply it in a manner that helps it work. Furthermore, it means making sure it comes in contact with the source of the odor. That’s why there is a shampoo for the dog or cat and a liquid for all the other surfaces. Pour it, spray it and fog it. It works! In conclusion, if you live in an area where skunks live and you have a pet, it’s best to have the Skunk-Off® BEFORE any issues arise. There’s no shelf life. It lasts forever. Do yourself a favor and get it now. You’ll be glad you did if you ever run into that furry black and white odor maker Mr. or Mrs. Skunk. Michael McGuire is President of Thornell Corporation. Thornell manufactures products that eliminate odors of all kinds and is active in the Veterinary, Pet and professional cleaners markets.